- Designed to fit in the palm of your hand, easy to carry, suitable for street performers with outdoor use. - Uses wireless 2.4G band, with automatic frequency hopping function to search for the best signal channel, to avoid interference. - 48KHz / 16bits audio sampling provides better high-quality sound than CD’s, presents rich, full and natural sound quality. 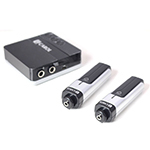 - Receiver provides instrument or microphone output, which also can simultaneously support 2 sets of audio transmission, for mixing and sound control. - Receiver Micro USB, in addition to support charging, can also be connected to the computer for music recording. and 30 meters in open outdoor areas. 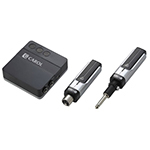 3 different typs of transmitters are available, along with a mini receiver. One system to turn your wired microphone into wireless.